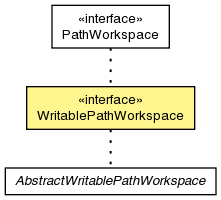 Extension of PathWorkspace for repositories that support modification of nodes as well as access to the nodes. Copy the subgraph given by the original node and place the new copy under the supplied new parent. Move the supplied node to the new parent within this workspace. Sets the given properties in a single operation, overwriting any previous properties for the same name. Move the supplied node to the new parent within this workspace. This method automatically removes the node from its existing parent, and also correctly adjusts the index to be correct in the new parent. Copy the subgraph given by the original node and place the new copy under the supplied new parent. Note that internal references between nodes within the original subgraph must be reflected as internal nodes within the new subgraph. Sets the given properties in a single operation, overwriting any previous properties for the same name. This bulk mutator should be used when multiple properties are being set in order to allow underlying implementations to optimize their access to their respective persistent storage mechanism.